Why choose London Met summer schools? Our summer schools give you the opportunity to explore university life and discover what your course will really be like. What will I do? At our summer schools you’ll have the chance to experience life as a first-year student. You’ll attend lectures, seminars and hands-on workshops, get tips on putting together your UCAS application and gain important study skills. You’ll also learn first-hand what student life is like from our student ambassadors. There will be lots of opportunities to make new friends too and enjoy the social side of university. The week will end with a graduation ceremony that your parents, guardians, family, friends and teachers are invited to attend. If you are on an art, architecture or design course, we will also hold a special exhibition to display your work at the end of the week. Our student ambassadors Our amazing team of student ambassadors are excited to welcome you to London Met. They will be with you all week to answer any questions you might have about university life and to help you make the most of your time with us. We will introduce you to the fascinating world of the British legal system. You will learn how law is relevant to what may sometimes appear to be the most mundane aspects of our lives and how law has developed over hundreds of years and continues to develop today in response to increasingly rapid social, political and technical change. You will have the opportunity to participate in a debate in our mock courtroom involving questions of human rights in relation to the expression of religious belief and to visit the Royal Courts of Justice. Working alongside our professional engineers, this practical and hands-on week will provide a great insight into the world of engineering. You’ll use an in-house designed system to develop programmes for a series of robots to perform a variety of tasks such as following a set course, avoiding obstacles and writing simple words. You will also attend a series of short lectures and seminars introducing robots, their design, operation and applications before building your own robots and presenting your work to an expert panel of industry specialists. During this inspiring week you will work with both a professional journalist and theatre writer, producer and director to develop and hone your writing ability. You will have training in journalistic techniques before you take on the role of reporter, photographer and sub-editor and use professional production software in our newsroom and radio studio to create your own news stories. You will also look at a variety of aspects of creative writing including character development, narrative structure and thematic clarity and gain an understanding of your audience both as a reader and spectator. You will take away a variety of work to add to your portfolio and meet students from related courses. Join us for a week exploring disciplines linking chemistry and pharmaceutical science. This year, sessions will include extraction of natural products, separation of compounds and analysis via thin layer chromatography, nuclear magnetic resonance and infrared spectroscopy. Sessions will take place in the University’s £30m Science Centre, which includes one of the largest open-plan teaching laboratories in Europe. Each day you will work with leading academics exploring different core areas of psychology and how it can explain human behaviour in real-world contexts. You will develop your knowledge through a mixture of lectures, seminars and handson workshops. Previous topics covered include personality, addiction, cognitive psychology, counselling psychology and conducting research. You will also be able to attend a taster lecture in another area of social science and meet current university students from a variety of subject areas. Led by our architecture tutors and students, you’ll explore a piece of London through sketching, writing and photography. You will develop stories, strategies and small-scale interventions to celebrate the richness of what is already here, to improve what can be improved and to change what must be changed. 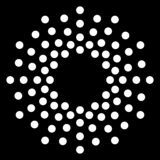 You will be introduced to professional ways of working and techniques of making, and the week will end with a presentation and exhibition of your work. We will also offer advice and guidance on preparing a strong portfolio. This course will introduce you to the role of drawing and sketching within the 3D design process and how it can act as an immediate and playful tool with which to bridge the gap between thinking and making. You will work across a variety of different sketching techniques including one and two-point perspective, contour and cross-contour lines, translating shape into 3D form and exploring the journey from representation to abstraction. You will build individual confidence in drawing as a vital component in the 3D design process. During this week you will have the chance to build and develop your photography skills in a range of hands-on studio sessions before heading out into one of the most exciting and fashionable areas of London to test out your skills. With the support of a professional photographer you will build your own portfolio with a range of portrait and location shots, using our photography studios to process and edit your shots to a professional standard. You will then curate your own exhibition at the end of the week. Taking inspiration from the sights, sounds and materials of the city streets, you will work with a top fashion designer on your own cutting-edge creations that tell a story about London and its people. Sessions will include a fashion trail around Shoreditch, mood boarding, mannequin experimentation and developing your own voice in fashion. At the end of the week you will present your creations in a special exhibition in our own public galleries. How to apply For further information about our full range of summer schools and to access the application form visit londonmet.ac.uk/ summerschool Select your first and second choice courses. We will endeavour to allocate your first choice but should this be full you will be offered an alternative if available. Complete the application form including details of a teacher who can be contacted to provide a reference. Be sure to complete your application by the deadline of Friday 31 May 2019. You will receive an email once your application has been processed and places will be confirmed in June. Is the summer school for me? London Met is an inclusive and diverse community and we welcome applications from students from all cultures and backgrounds. If you have a health condition, learning difficulty or disability we can talk to you about how best to accommodate your needs before you attend. If you are/have been in care, please let us know in your application and we may be able to contribute to your travel expenses. If you would like to talk though any of your needs before applying please donâ&#x20AC;&#x2122;t hesitate to contact us on the details above. Similarly, if you are concerned about the entry requirements of any of our programmes please do get in touch and we can chat this through with you. Still have questions? Have a question about our summer school? Want some further advice on which course to choose or how to apply? Please get in touch with any questions, we would be more than happy to answer them. Schools, Colleges and Widening Participation Team London Metropolitan University 166-220 Holloway Road London N7 8DB londonmet.ac.uk/summerschool @LondonMetWP #LMSummer If you would like to request further brochures or an alternative format please contact us on the details above. 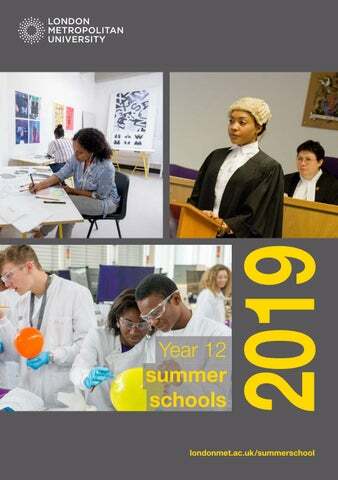 London Metropolitan University's summer schools 2019 booklet of activities for Year 12 students.